His name is Jack Oliver and he is a month old. 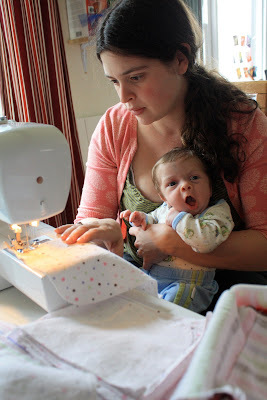 It's been an exciting month and I'm finally settling into a new normal, so let's get back to craftin'! We have already purchased a Costco-sized box of wet wipes and I'm realizing how we're fast becoming a wasteful family. We are doing a combo of cloth diapers and disposables, so I thought I'd give cloth wipes a try. Today was the first big garage sale day and for once I'm actually stoked when all a garage sale has is baby stuff. I found some nice clothes for Jack but I snagged several flannel receiving blankets to craft out with. 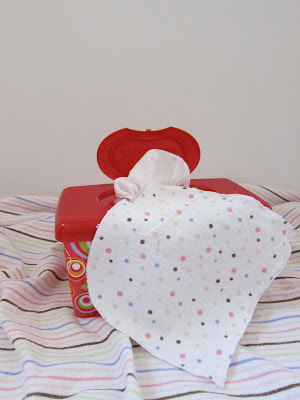 Homemade wipes are super easy. Since I'm washing cloth diapers anyway, I figured a few scraps of flannel added to the wash wouldn't make a big difference. Cut your blankets into 7-inch squares. No need to be precise. You'll end up with about 16 squares per blanket. Using a wide zig-zag (or a serger machine is even better!) sew a border around any unfinished edges. I just incorporated the finished edges into each square. Fill up your empty wet wipes box. If you have time (and I doubt I'll find myself doing this often) overlap each wipe so that when you pull out a wipe, then next one will come out. I plan on wetting each wipe as I use it with a spray bottle of water with a small amount of baby oil and baby soap in it. I suppose you could prewet the wipes by pouring some water into the wet wipes box after it's filled. I'm not sure how that works, but I'm sure it's fine. Once a wipe is used, place it in your designated dirty cloth diapers receptacle. When it's time to wash the wipes and diapers, here's what I do (this is after hours of online research on washing cloth diapers using homemade detergent). I use a combination of equal parts Borax, Arm & Hammer Soda Wash (found next to Borax in grocery store) and Oxy Clean. I have a front loading HE machine and I run it through two cycles. The first cycle I run on cold and add one tablespoon of detergent. The next load I select an extra rinse cycle, add another tablespoon of detergent and run the load on hot. Either line dry or dry on hot for more than an hour. how do you wash them? do you rinse them after each use before washing, how do you keep them before washing? Hello, sorry for the delayed reply. We collected the wipes in a washable diaper bag and then ran them through the wash with our cloth diapers back in the day. I used a homemade detergent of equal parts Borax powder, Arm & Hammer Soda Wash (not baking soda) and OxyClean. Just a tablespoon per load. Washed them on cold and then did another rinse. They've kept so well that we're still using them after three years!